Guessing Who Will Win Today’s Match? 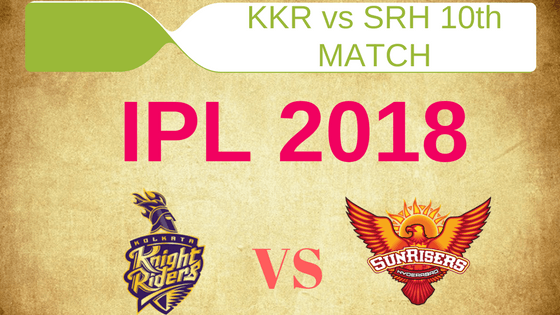 Read our Astrology & Expert view on Today Dream11 Fantasy Cricket Prediction of KKR vs SRH 10th T20 Match IPL 2018 which will be played on 14th April 2018. In this post we will cover playing 11, pitch report of Eden Gardens, Kolkata, what astrology has to say on the toss. We will also cover full details on players recent and past performance, weather report of Kolkata, the best choice for captain and vice-captain for today’s match, Dream11 guru prediction, Key players, where to watch the live match of SRH vs KKR and details about live streaming. Make sure to read the whole post as these data and statistics are taken from very reliable sources and are 100% accurate. Who Will Win the 10th Match of IPL 2018 Between KKR vs SRH and Toss Prediction? Highest total on this ground is 201/5 in 20 overs by PAK v BAN. Lowest total on this ground is 70/10 in 15.4 overs by BAN v NZ. The pitch of Eden Gardens has changed a lot in a couple of years. Previously it helped spinners but now the things have changed. The pitch will support seamers. The bowler who hits the deck hard will enjoy the most. Dew will be an important factor for today’s match. Around 03: 00 PM IST Isolated thunderstorm is expected. It is expected that before the match it will be partly cloudy but during the match, the weather will be mostly clear. No rain is expected on today’s match. The temperature of Kolkata will be 29-Degree Celsius and humidity will be 76% which may go up to 80%. If we look at the last five matches KKR team is ahead of SRH. KKR has won 3 games out of 5 games whereas SRH has won 2 matches out of 5 matches. It will be interesting to see which team increases their winning percentage. Star Sports has paid a huge amount of INR 16,347.50 Crores to get exclusive rights of IPL 2018 for live coverage for five years starting from 2018 to 2022. Star Sports has all the media rights including TV and all Digital Rights. You can watch the full match of Kolkata Knight Riders vs Sunrisers Hyderabad on Star Sports. Sunil Narine, Dinesh Karthik (c & wk), Robin Uthappa, Tom Curran, Javon Searles, Chris Lynn, Vinay Kumar, Apoorv Wankhade, Piyush Chawla, Nitish Rana, Shubman Gill, Andre Russell, Mitchell Johnson, Cameron Delport, Rinku Singh, Ishank Jaggi, Kuldeep Yadav, Shivam Mavi. Rashid Khan, Wriddhiman Saha (wk), Shikhar Dhawan, Mohammad Nabi, Billy Stanlake, Mehdi Hasan, Kane Williamson (c), Carlos Brathwaite, Manish Pandey, Ricky Bhui, Shakib Al Hasan, K Khaleel Ahmed, Siddarth Kaul, Bipul Sharma, Sandeep Sharma, Deepak Hooda, Bhuvneshwar Kumar, Shreevats Goswami, Basil Thampi, Yusuf Pathan, Sachin Baby, Alex Hales, Chris Jordan, T Natarajan, Tanmay Agarwal. Being an initial stage of Indian Premier League both the teams have realized that what are their strengths and weakness but both the teams are struggling in one common department that is fielding. As the game progress, SRH and KKR will definitely want to improve on that part. After making a huge total KKR couldn’t defend it in the last game, this may lead Dinesh Karthik for a couple of changes in their team. Vinay Kumar has conceded 65 runs in last 3.5 overs, so Shivam Mavi or Kamlesh Nagarkoti may replace him. Shubham Gill may replace Rinku Singh. Robin Uthappa, Chris Lynn, Kamlesh Nagarkoti/Shivam Mavi, Sunil Narine, Kuldeep Yadav, Nitish Rana, Shubman Gill/Rinku Singh, Piyush Chawla, Andre Russell, Dinesh Karthik (capt, wk), Mitchell Johnson. Kane Williamson will most likely play with the same team which played in the first game but there is a twist, only if Bhuvneshwar Kumar passes the late fitness test before today’s match. Our prediction is SRH will play with the same playing 11. Deepak Hooda, Shikhar Dhawan, Kane Williamson (capt), Bhuvneshwar Kumar/Sandeep Sharma, Billy Stanlake, Wriddhiman Saha (wk), Shakib Al Hasan, Manish Pandey, Rashid Khan, Siddarth Kaul, Yusuf Pathan. Pro tips: The above players are most likely to perform. Make Captain and vice-captain from the above list. Pro-tips: You can make captain and vice-captain from the above list. If we look at both the teams, SRH seems to be more balanced but KKR has more pinch hitters. On paper, Sunrisers Hyderabad is a strong team. If you still thinking who will win the 10th match and if you want to go by our prediction then our team predicts that SRH will win the 10 match against KKR. The trend of IPL 2018 is to win the toss and choose to bowl and win the match. This is the short story of recent matches. Sunrisers Hyderabad will win the toss today and will ask KKR to bat first. Our astrology department also predicts that SRH will win the toss. Conclusion: This is it for Today’s Dream11 Fantasy Cricket Match Prediction of SRH vs KKR, 10th T20 Match, IPL 2018 which will be played on Saturday 14th April. You can give your valuable feedback in the comment section. Subscribe to our notification of latest updates. GOODBYE!